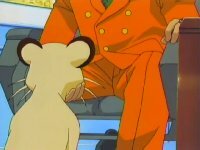 Discussion in 'Pokémon Animé Discussion' started by Serebii, May 1, 2006. Maddie Blaustein, best known around these parts as the voice of Meowth among many other characters, has kindly agreed to be here and answer questions put forward by you, the fans. Which Meowth? Old or new? pharaohguy530 The one and only. Ya know, Joe I was going to suggest this in the thread. You like read my mind. Anyway, here are my two questions for everyone's favorite feline. Actually..isn't that Garfield? No wait, it's Meowth. Gotta be. 1.) Maddie, how does the dubbing process work? Did you get the Japanese version and the writers translate it? I guess they do that ansd you go into a studio like an actor would for any other cartoon. 2.) Have you or anyone on the cast met your Japanese counterparts? From what I understand, the Japanese Meowth is quite poetic. Doesn't have the same feel as the Brookyln brwalin' Meowth but then again I don't understand Japanese. Thanks for your time and thank you for visiting SPPf. It's a fun place and I hope you stick around! Edit: Same goes for me, Fonzie. Though I can't do anything about it. Although I am not much of an anime fan, I've always been wondering about a couple of things. 1) What influences did you have when "creating" Meowth's voice? Was it just the director or were you allowed to import a personal tone too? 2) How many hours does it take for the dubbing of an episode in general? 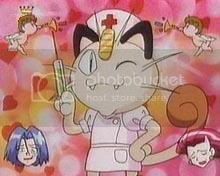 Meowth has been a nonstop joy to voice for 8 solid years I loved every minute of being Meowth! 1) In all the episodes you have dubbed Meowth in, which was your favourite to dub and for what reason? 2) Is there any interesting background as to how you came to dub in Pokemon? 1.) 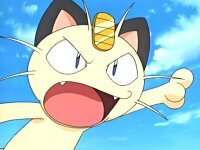 Assuming you've had the chance to listen to a few of them, what are your opinions of Meowth's voice in various other languages? Have any of them influenced your portrayl of the character in any way? 2.) What are your feelings regarding Team Rocket's purpose on the show? Do you think they work as comic relief characters, or do you feel that, as the main villains they need to have more sinister moments/successes? The Japanese scripts are translated and then refined by a script-writer who carefully makes sure that the new script matches up with the lip-flap as best they can. Then the scripts are given to the director who casts any remaining filler parts. By the time I get the script it's polished to it's final draft, and the director tells the "talent" (that's what they call us) what the episode is about and what the character arcs are. Then --I pretty much go to town! When the director wants a different read from me he'll ask --but after 8 years of doing Meowth, I pretty much get it right the first time I read it at this point. 2.) Have you or anyone on the cast met your Japanese counterparts? From what I understand, the Japanese Meowth is quite poetic. Doesn't have the same feel as the Brookyln brwalin' Meowth but then again I don't understand Japanese.. I have never met Inuyama Inuko, but I have always tried to make my Meowth and her Meowth scream the same For whatever reason it was decided from the beginning to make Meowth in America a real wiseguy Brooklyn type. Since I actually live in Brooklyn --it was pretty easy for me to do! 1) My influences on Meowth start with Bugs Bunny, Joe Pesci and Shirley Booth from the old TV show Hazel. 2) Depends on the episode. I'm usually booked for a couple of hours. 1) I heard the audio commentary on the 4th movie, Pokémon 4 Ever... And there you said you also hear the Japanese version of the show. Do you look up to anyone that does the voices there? Wow, I can't say how excited I am... I hope you stick around! ^^ I heard you like to know what the fans think... *Bill's voice comes to mind* Feel free to PM or e-mail me! And now, the amazing dancing Zoroark! A Q and A with one of the voice actors...nice. 1. In the early parts of the series Meowth had a lot of "Meowthisms". However, after you took over you did them less and basically stopped by the end of Kanto. What was the reason(s) for that? 2. What's next for you now that Pokemon has been handed over to PUSA? Glad to be able to get some feedback from an insider and I hope you enjoy your membership here. Now if only we could get NewBrock to do one of these. Some people don't think it's funny that Exit 69 gets off on Big Beaver. 1) I've only heard them --never seen them to picture, so I can't judge how well they match flap --but they all make me laugh. The one from Israel sounds like Jerry Lewis to me , and the German one sounds particularly mean. 2) Team Rocket are the good guys. The Twerps are the villains. Duh. I remember you saying that from the Pokemon 4ever commentary when someone, I think Norman, brought up how different Japanese Meowth was to his western counterpart. Hi Maddie, I think you do an awesome job at Meowth's voice! 1) What other character's have you voiced in Pokemon and other shows? 2) Is it possible to get your digital autograph? I want your autograph. ;052; Sorry If im not allowed to ask. 1. I recall you saying that the outcry to "Legend of Thunder" made 4kids cast Harley correctly. However there are some good Team Rocket episodes in that "Chronicles" series, but us Americans never got that series. Do you happen to know why Pokemon Chronicles was only aired in the UK, and this series never came out in the U.S, even on DVD? I'm curious. 2. There was one episode where Meowth dressed up as May, did you have a fun time trying to be 10 year old May as a coordinator? Just one question for me. - Since no one ever knows if something's going to be a hit, what was your reaction when you discovered the show you were working on was not only the most popular thing in the states, but pretty much the world? I think it's really great that you're taking time to talk to the fans, it's not every actress who would do that! I've loved your portrayal of Meowth through the years, he's one of the best characters and I'll miss his voice terribly. I also liked your Bill and Seymour voices, I wish we had got to see them a second time. 1. What was your favorite episode to act in or watch?